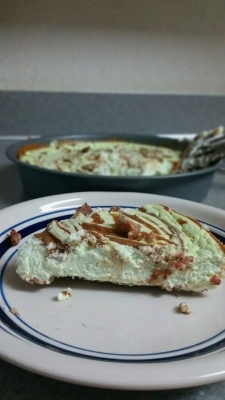 This amazing, healthy protein cheesecake - complete with an amazing "crust" - incorporates cashews, coconuts, and almond butter! You won't believe how healthy it is! Heat the four LARA bars in the microwave for about 25-30 seconds until softened. Spray a 9 inch round baking pan with APM non-stick cooking spray. Smush the softened LARA bars at the bottom of a 9 inch baking pan until the bottom of the pan is completely covered with a layer of the bars. Set aside. Mix the following in a good quality blender in the following order and blend as you go after each ingredient is added: egg, liquid egg whites, almond extract, unsweetened coconut milk, sugar-free Jell-O pudding mix, non-fat Greek yogurt, fat free cream cheese, whipped Greek cream cheese, liquid stevia, and whey protein powder. Blend well until completely mixed, then pour mixture into the baking pan, on top of the LARA bar crust. Using a knife, swirl the almond butter evenly in swirls on top of the cheesecake mixture. Heat oven to 250 degrees and bake for 20 minutes. Bake for another 20 minutes at 300 degrees, then bake for another 20 minutes again at 250 degrees for a total of 60 minutes of baking time. Put cake in the fridge over night.